Even if you aren’t particularly keen on rocks, you can’t fail to be impressed by Staffa. Lying about six miles west of Mull, this tiny island rises out of the sea like some kind of giant soufflé, its black basalt columns providing a source of awe and wonder for a steady stream of sea-borne visitors. 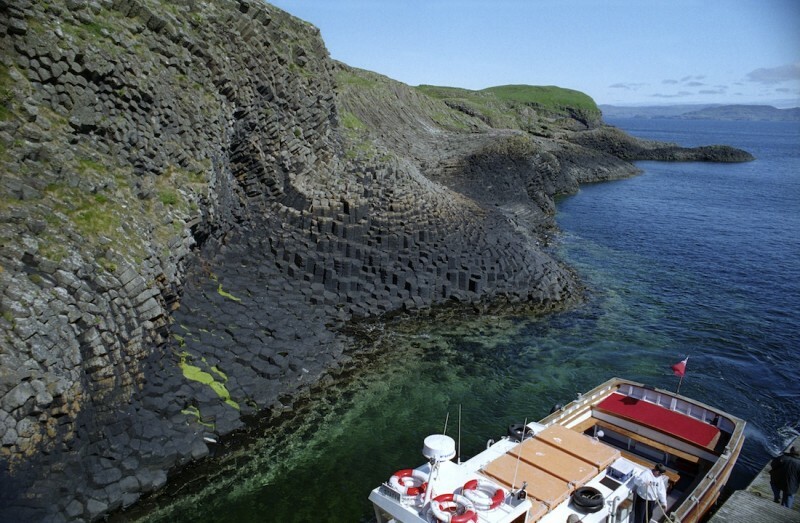 Staffa’s amazing geology was laid down about 60 million years ago, as a lava outflow cooled and solidified extremely slowly, allowing massive crystals of basalt to form; these are mainly hexagonal, but some are three-sided or eight-sided. 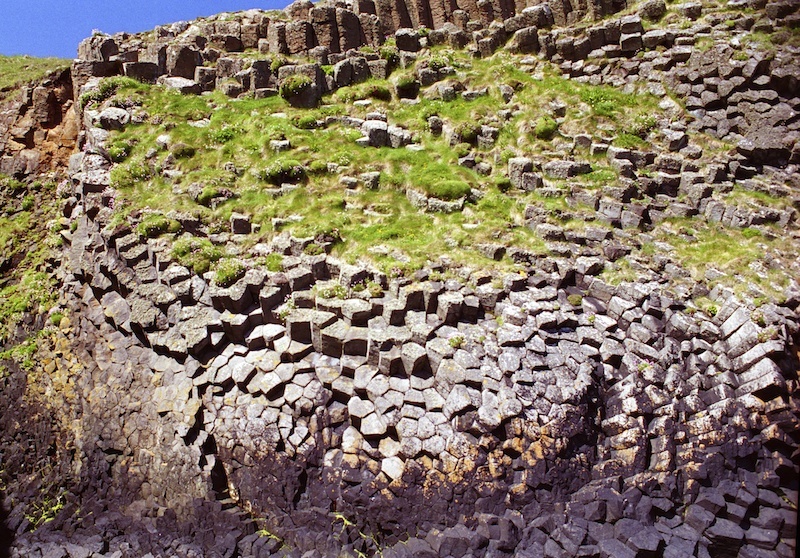 Similar formations can be found on the nearby Treshnish Isles, the islands of Mull and Ulva, and in the Giant’s Causeway in Northern Ireland. Several sea caves have been created in the dark cliffs, where the sea has broken through crevices and weaknesses in the columns. 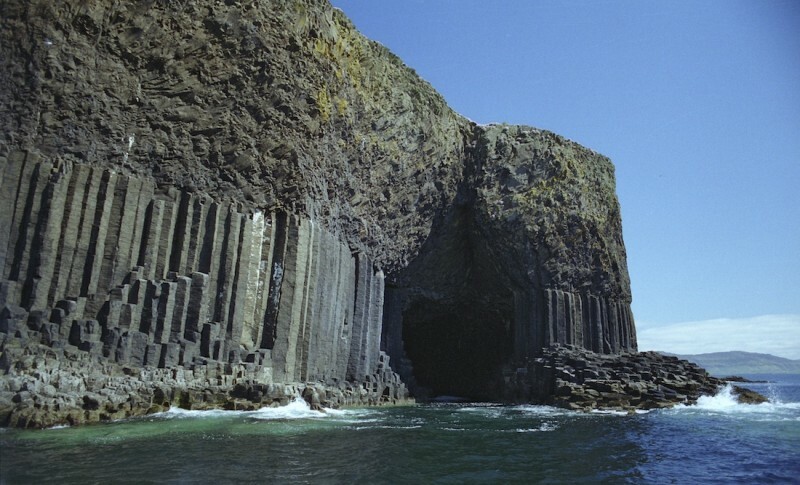 The largest is Fingal’s Cave, which inspired the composer Felix Mendelssohn to write his ‘Hebrides Overture’ following a visit there in the 19th century. At that time, Queen Victoria’s love of Scotland was creating a rush of tourism and Staffa was one of the places to go; it wasn’t the most easily accessible, but this didn’t deter the most eminent writers, artists, poets and explorers of the day, as well as Queen Victoria herself, from being rowed over there in small boats. 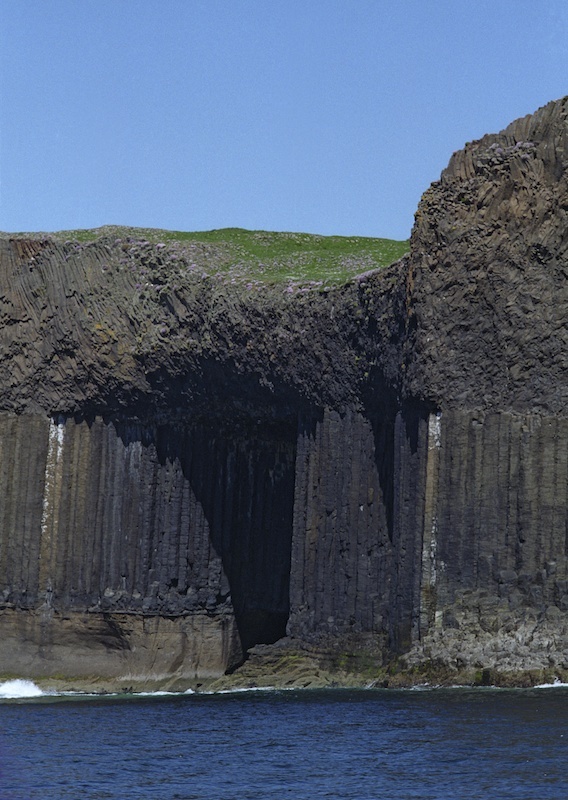 Most of Staffa’s upper surface is covered with a close-knit layer of grass and thrift; there’s not enough shelter to support trees. Though dreamlike on a summer day, the island is scoured by Atlantic storms and it must be pretty inhospitable in bad weather. It’s hard to believe that, until the 1700s, it was inhabited by at least one hardy family who lived on barley oats, flax and potatoes, and kept a small number of farm animals. Later, crofters from the nearby island of Iona grazed their sheep there, but by 1997 all livestock had been removed. Not surprisingly, there are no deer on Staffa, but the cliffs provide habitat for nesting puffins and kittiwakes, and the surrounding waters are a rich source of food for marine mammals such as seals, Minke whales and dolphins. 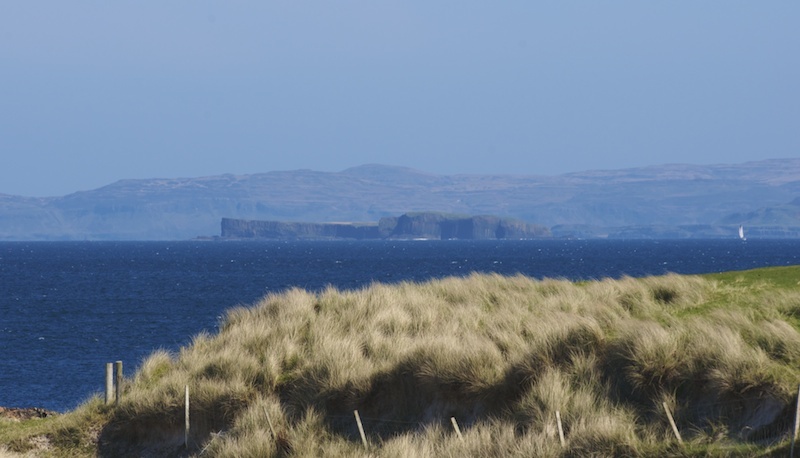 A number of boat operators offer daily trips to Staffa, often taking in the Treshnish Isles and Iona as well. If conditions are calm enough, they will allow you to land on the island for an hour or two, so that you can clamber around the slippery rocks to the cave entrance or walk along the cliff paths and soak up the amazing views. Getting there means a ferry trip from Oban to Mull, and then a drive down to Fionnphort, where most tour boats depart from – but Staffa is an unforgettable place, and it’s well worth the effort. Amazing photos Jo. Staffa is such a beatiuful place, a wildlife heaven:-) love your magazine by the way! Thank you so much! Yes, Staffa is wonderful – there’s something about the islands, even in bad weather. You could spend a lifetime exploring them all. A wonderful essay capturing a sense of place! Beautiful! Thanks for the story also. These columnar basalts remind me of similar formations we observe on Idaho’s Salmon River on the lower gorge. This region, and my backyard, is what geologist call a fracture zone, or suture zone. Millions of millions years ago, the east side of the Salmon River (near Riggins) was part of the main continent of North America. The west side of the river is where islands off the coast of Alaska drifted down and collided with the mainland. However, within the last 30 million years (Micene age) the Columbia Plateau region experienced a series of lava flows (similar to Staffa) that covered the same region, both sides of the river. This process repeated itself over and over, so now in the main canyon, in some places you can see from 70-80 different layers of lava flows. Each is seperated by sedimentary layers. Basically,cracks in the earths surface opened up and lava oozed out over the general landscape. It dammed up the major rivers (Snake and Salmon) and created lakes. Sediments formed in the lake bottoms and the outlet of the lake created canyons (Hells Canyon & Salmon River Canyon in this case) that got deeper chronologically. The result was a mixed layer cake affair – with lava and sediments sandwiched together. In some places when floating the Salmon River, we pass through lava flows that the river itself has incised directly, with columnar and pillow basalts on each side. It is a great ride through time and beauty. Your photos, are beautiful, by the way.